Our last rain was weeks ago. After all, we live in a place that gets only an average 8 inches (200mm) of rain per year. Damp earth is always temporary here. After the rain, two seeds quietly sprouted beside the curb, at the curve of the road. The ground returned to dust. They thrived. It was a dusty and seldom tended place, on the ‘nature strip’–not owned by the houses on either side. No man’s land. The small plants grew at a rapid rate, extending variegated, pointed branches in all directions. A woman who regularly walked the roadside where the plants grew, took note of them. 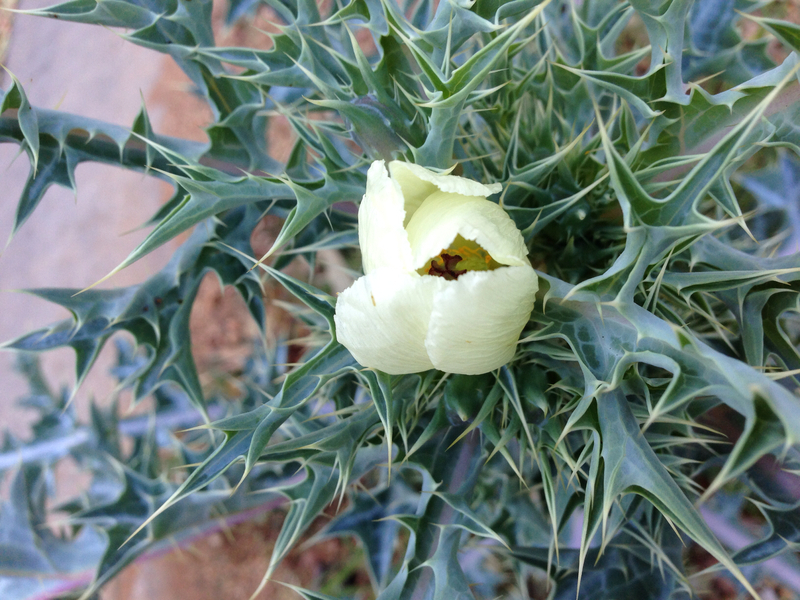 They were unusual, but beautiful–in a spiny way. She had some experience photographing spiny plants in the arid lands and even a close encounter, or two, with prickles that she’d rather forget! But she made a mental note that when the light was right, she would stop and photograph the plants. One morning, the woman did indeed take a photograph of the plant, though the result was unremarkable, except that it recorded a life. But she regularly observed the changes in the plants. After a week or so, she noticed atop one of the plants a small white pillow-y shape. She got closer. A blossom! She bent to photograph it in the early morning light. 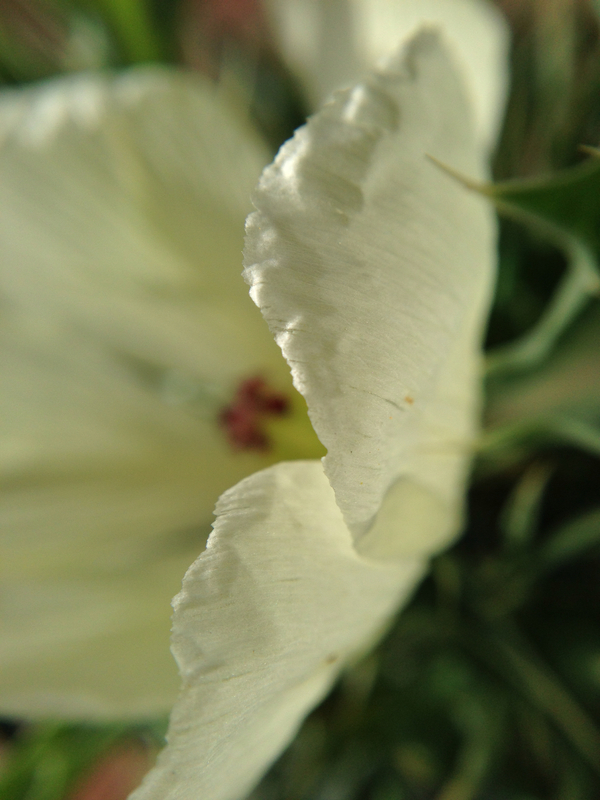 It was made of delicate, gossamer petals that would be a flicker of soft ephemera and then gone. Capturing the fleeting beauty called for strategic effort. It was a cloudy day that afforded photos one often could not accomplish in the bright, clear sky of central Australia, and possibly meant the blossom would last a little longer. Think hours, not days. The woman returned to the blossom a couple of hours after first seeing it, in hopes the flower would be fully opened. What luck. 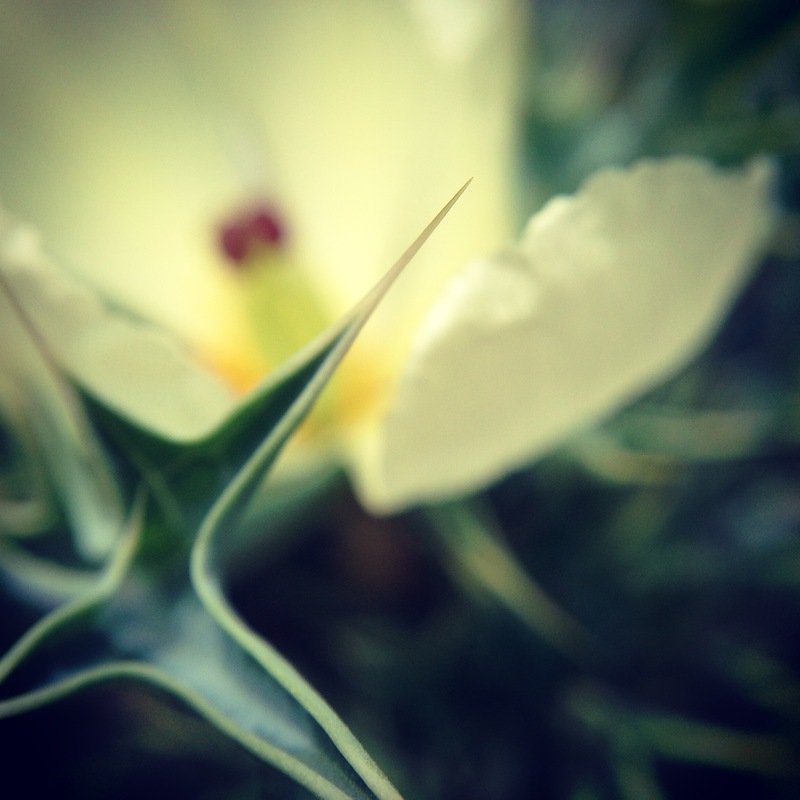 It was like many cactus blossoms she had seen, a splash of floral silkiness amidst forbidding spines, unapproachable to many, all the more alluring because of it. But she was sure it wasn’t actually a cactus. A couple of hours later the woman returned to the blossom to see its progress. It was nearly spent, flaccid and waving in the arid breeze. Its delicate centre now dried. The moment of glory finished. The next day on her walk, the woman approached the plants with anticipation. Gone! Extracted by their roots and disappeared completely. The end of life. Ah, she thought, at least I preserved some memory of them in their prime. It reminded her of the photo album she was putting together, and some humans she had known. People could be prickly and hard to handle, then shine in a moment of photographed brilliance. Glorious. Then gone. She was grateful for photographs. She later discovered the plants were Mexican Poppies, toxic to all animals and humans. Pity. Her husband declared ‘someone has done the environment a favour’. True enough, she guessed. But not before the siren-like, petals enchanted her and reminded her of the nature of some of us, and the potential for beauty in all of us. Awesome photos and story Ardys! You should have your work published. I feel privileged to know you and your work. Look forward to many more! Very kind and generous of you Chris! Life is so full of these moments, I am privileged to be able to share them. Absolutely exquisite. The tender flower amid the dangerously thorny spines, the transient and fleeting beauty of lives passed almost unnoticed yet full of impact in the most surprising ways; you’ve captured it all here marvelously. Very kind of you to reblog this piece, David. Thank you for the compliment, much appreciated. Lovely eulogy for a plant that as well as its shadow side has beauty and graceful form. Despite its short earthly life, the woman has granted it recognition and acknowledgement of its worth, regardless. Thank you EllaDee. I hadn’t actually realised I was writing a Eulogy, but you are so right, as usual! Oh, Ardys, this was so lovely to read first thing this morning – yes I’m a bit late getting up but why not? We have another sweltering day in the forecast! Your prose is simply beautiful and the photography stunning (but that seems too loud of a word for these soft and exquisite photos). I felt as if you were describing the very spirit of myself. What a lovely compliment, thank you! I’m a bit late getting up myself this morning— pretty cold on our side of the planet at zero! Quite profound Ardy. I enjoyed the photos as well as your thoughts and felt as if I was wandering along the road with you. 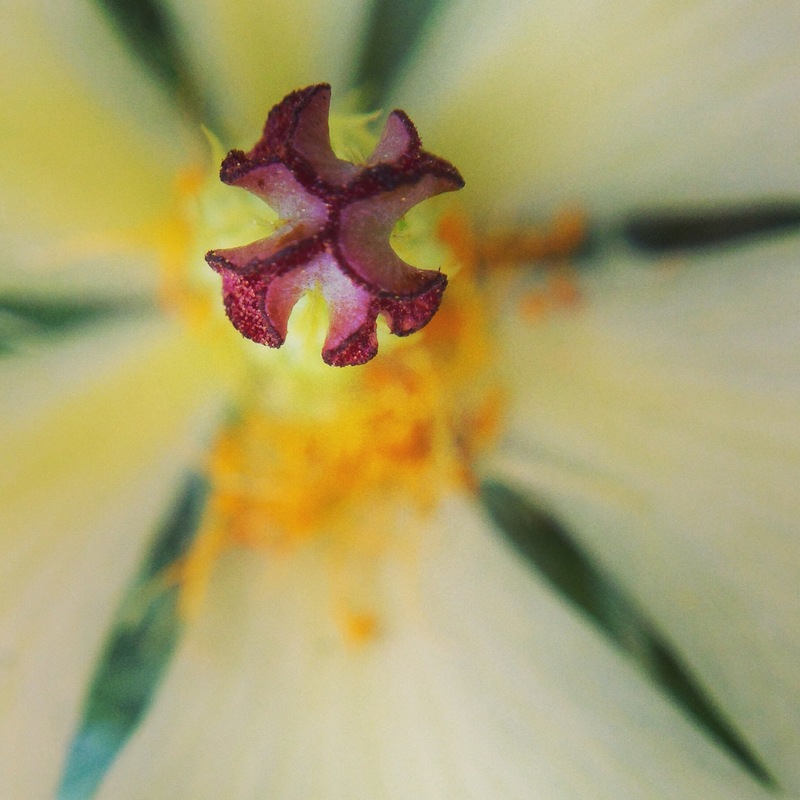 Prickly plants often have the most interesting flowers and stunningly beautiful stamens. 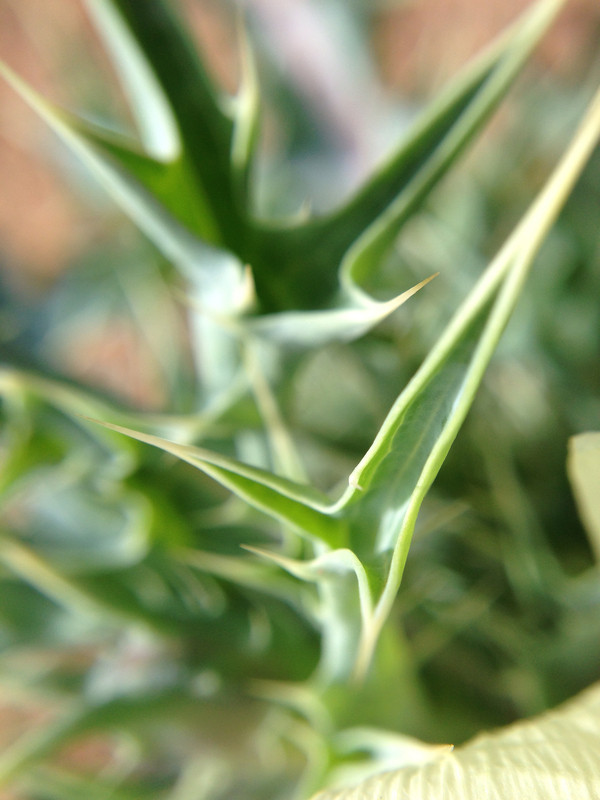 Just like their human counterparts, they need these prickly defenses in order to survive in hostile surroundings.. The petals really do look like poppies. Paper thin and fragile. Thank you so much Francesca. Yes, the flower really did look like a poppy, and I’ve always had a fondness for poppies. Beautiful. The words and the photos are just perfect.